Redworth Hall, a 17th-century country house. Now a listed building. It was just three years ago that Spirit of Atticus made its first tentative steps in the 4NCL at the same luxuriously appointed venue with the same baffling inter-connection of facilities. The League of the region of post-industrial dereliction [Editor's note: The Northern League] was born that day too and has proved another great success for the 4NCL with this year's entry moving towards double the original number. Taking the positives from our narrow relegation after two seasons in the second tier of Britain's premier team tournament, we bit the bullet and Spirit of Atticus B was born. The first round promised to be a real test of our resolve with the A team in action against the 1st team of the newly formed [by amalgamation] Ferry 'Cross the Maroczy. The B team found themselves pitted against North East England 1, relegated from division 2 like us at the end of last season, who were very firm favourites for this contest even without "home" advantage. With three new boys on show across our teams the traditional first round nerves were heightened. The first of the newcomers was Peter Jowett, who after loyally sitting on the bench last season without getting the call, found himself in at the deep end on board 3 in the first team. It should perhaps be stressed that there was no shallow end for us on this Saturday: Michael Johnson whom I had met only via the net prior to this weekend [reassurance to worried parents at this point: Michael is known personally by other members of the squad. Warnings: children  do not meet people in person to play chess if you have only previously met in cyberspace. 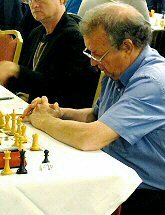 do not trust people who play the Benko gambit, was on board 2 for the second team; John Hall who has a claim on Andy Mort's record of 35 years between successive Atticus appearances [1975-2010] with a figure of 43 years between appearances [1970- 2013] was on board 3 in the second team. This claim is in dispute because Atticus was not formed until 1972 but it is definitely 43 years since John and I last met. The first team match gradually crystallised: a quick but entertaining game on board 6 between Dave Latham and Tom Bimpson ended with a perpetual check. Next Peter Jowett delivered a speedy win on board 3 which enabled everyone on our side of the pairings to relax a little and was a vital contribution by Peter on his debut. Draws followed by the three hour mark for Peter Ackley on board 5 and myself on board 1. This left two in play; Nick Ivell on board 2, seemingly inexorably advancing on opponent Steven Kee's king and Andy Smith on board 4. Following a war of attrition, Andy suddenly broke from behind his lines to consume lots of pawns and the victory followed swiftly. Nick completed the slightly flattering 4½-1½ victory with the best game of this match. As this match concluded all six games were still in play for the B team! Although finally succumbing 5-1 we were able to draw some positives from the match. Steve Connor's win on board 5 was game of the day by an Atticus player, showing adventure throughout and flair in the denouement, and the fighting spirit throughout the team was tremendous. John Hall and opponent Roger Coathup were last in the hall to finish, into their seventh hour of play. It was, as the players observed, a game with an opening, a middlegame and an ending. The middlegame was electric, seemingly incalculable at times, and it was there that the decisive moments came. Julian Allinson on board 4 against Andy Mort played a fine game [at least it caught the spectators' collective eye]. There was almost rioting on the streets of Bourne End [Editor's note: a place in the South of England where some of our team reside] when the Grubmeister, Dave Robertson, announced that the Spirit of Atticus team would, for the first time ever, eat at the hotel where the matches were being played, [i.e. in this case at Redworth Hall] rather than heading into the local or indeed not so local community. 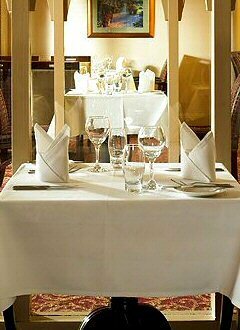 The mob was placated by Dave promising this to be a one off venture and it went smoothly enough with a decent variety of good food, pleasant service and, crucially for many, a suitable wine list. 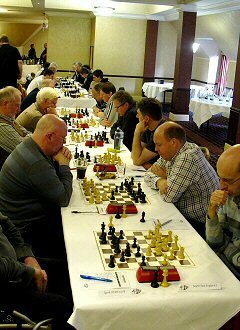 With the World Championship match in full swing quite a lot of the discussion centred on the methods of Magnus Carlsen. At this juncture we feel that already we have made real progress in looking inscrutable but are having some problems in turning this into actual chess moves; still it is early days. And so to the second round : The A team were playing Manchester Manticores 1, who had won 6-0 on the Saturday and the B team were against Bradford DCA C. The first team match was unclear for a long time; eventually the top 4 boards were all drawn. We could claim to have made the running in three of these games but the escape of the day was by Andy Smith on board 4 who made the most of good fortune to make up what had been a piece deficit. The match was delivered safely by John Hall and Michael Johnson on the bottom boards, each gradually increasing the pressure: John landed a quick K.O. and Michael just accumulated material as his advantage became overwhelming. This was a pleasing bounce back by our two debutants after a tough baptism on Saturday. The Surtees Room at Redworth Hall's Conference Centre - an ideal venue for seven, 6-board matches. Dave Robertson walked into an opening trap so the B team soon found themselves trailing. However they proved unflappable to a man and after many murky adventures emerged as 4-2 victors. Dave Latham caught the eye for the messiest of the messy wins just edging out Dave Stuttard and Peter Ackley but it was a close run thing. The B team is the place for the all or nothing brigade; who will be the first to crack and agree a draw? The answer to this and other more pertinent questions will have to wait until January when we assemble at a new venue to us, Shrigley Hall near Macclesfield. As usual we can hardly wait.